Paducah Arts Alliance (PAA) is pleased to announce that Tim and Sarah Lazure from Greenville, North Carolina, are the current participants in the Paducah Artist in Residence Program. Their Paducah residency coincides with Tim’s involvement with the Paducah School of Art & Design’s (PSAD) 2016 Master Artists Workshops. 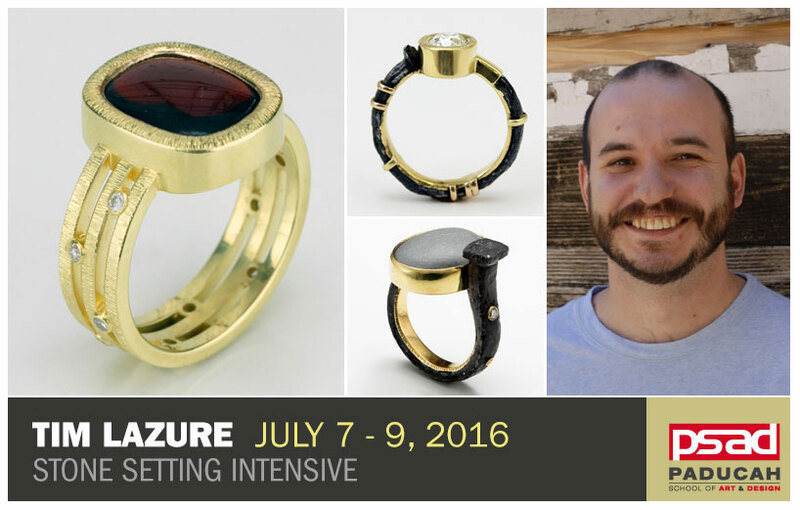 Tim conducts metals design workshops across the country and presented a three-day workshop at PSAD in the summer of 2015. “While at Paducah, I was charmed by Paducah’s creative culture and wanted to return to support a community so dedicated to the arts,” said Tim. He will be conducting his Stone Setting Intensive workshop at PSAD on July 7-9 as part of the 2016 Master Artists Workshops. This workshop will cover a wide variety of techniques and provide the opportunity for artists to dedicate time to honing their stone setting skills. Tim and Yoshi Fujii, a resident artist and instructor at Baltimore Clayworks in Maryland, will present a joint artists’ talk at 6 pm this Friday, July 9, at PSAD’s 2D and Graphic Design Building, located at 905 Harrison Street in Room 208. The talk is also a program of PSAD’s Master Artists Workshop series and is free and open to the public. The Lazures began their 2-week PAA residency on July 1. Tim is an Associate Professor of Metals Design at East Carolina University (ECU), where he has taught for over 13 years. His work is in the collections of the Mint Museum of Craft and Design, and the Gallery of Art and Design in Raleigh, North Carolina. His jewelry, silversmithing, and furniture designs have been featured in national and international exhibitions, and images of his work have appeared in numerous trade publications. Sarah is a graduate student pursuing her MFA in photography at ECU. Entering into her thesis year, Sarah is solidifying her body of work while still exploring new techniques and processes. Artists participating in PAA’s residency program are required to engage with the community through exhibitions, workshops, public lectures and/or collaborative projects with local artists. Tim and Sarah intend to engage this UNESCO Creative City of Crafts and Folk Art as active participants–visiting galleries and museums, being visible in town as visiting artists, and interacting with the community. At the conclusion of their PAA residency, the Lazures will present a free public demonstration and discuss their individual art and the journey that led to their collaborative work at Pinecone Studio and Gallery, 419 N 7thStreet, on Wednesday, July 13, at 5:15 pm. To arrange an interview, contact Rosemarie Steele, Tammy Thompson, or email Tim Lazure directly or call him at or 252.414.1558. With the annual workshop series, which began in summer 2014, PSAD positioned itself within a national context and set the stage for the years ahead with an exciting selection of workshops in ceramics and metals. This year’s program once again focuses on ceramics and small metals, featuring intensive workshops with nationally recognized artists and experienced workshop presenters Sunshine Cobb, Jill Baker Gower, Elaine Henry, Yoshi Fujii and Tim Lazure, who is returning for a second year. To register for workshops visit PaducahSchoolofArtandDesign.org.